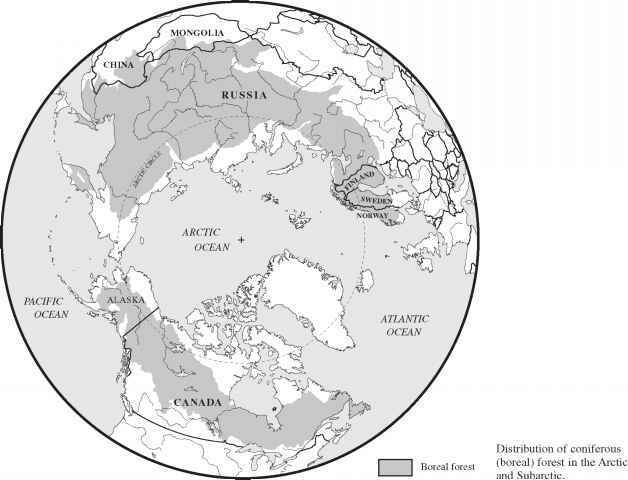 Immediately south of the Arctic tundra lies a circumpolar band of forest variously termed the northern coniferous forest biome or the boreal forest or the taiga. Taiga is broadly defined here, but it should be noted that some ecologists would consider taiga to be only that band of conifers that lies roughly between 50° and 60° N latitude in both hemispheres where the growing season lasts about 130 days, total annual precipitation ranges from 40 to 100 cm (15.7-39.4 in), and the treeline (timberline) roughly approximates the average summer isotherm of 10°C (50°F) (the treeline often lies far to the south of this isotherm). At the tundra-taiga interface or ecotone, the landscape often looks more like tundra than forest, for here the trees are few and far between. and Larix (tamarack, larch)—all members of the pine family (Pinaceae) and all evergreen except for the deciduous larch. Survival of all the plant forms and of all the year-round animal residents depends on successful adaptation to long, cold, dark winters and short summers. Moreover, plants must accommodate to soils that are poor in nutrients and, in many places, permanently frozen just a few inches/centimeters beneath the surface. Winter subjects plants to continuous drought conditions because water lost through transpiration cannot be replaced until the spring thaw. In the forests of central Alaska, the rains of summer combined with snowmelt yield an annual precipitation total of 10-20 in (c.250-500 mm). Such a modest total would produce near-desert conditions were it not for the fact that the sphagnum mosses (Sphagnum spp. ), often so abundant on the floor of the taiga, accumulate and retain water, and that where permafrost occurs, rain that does fall cannot sink far into the subsurface, thus remaining available to the root systems of the plants. The rootlets of many kinds of plants, especially conifers, exist in a mutualistic relationship with fungi (mycorrhizae) that facilitate water and nutrient absorption. The needles of the evergreen conifers are narrow, contain chlorophyll, and usually have their stomata deeply sunk into a waxy coating. Because the stomata are deep-set, they are more or less protected from the winds of winter, and thus from excessive transpiration. The waxy coating also limits transpiration and the narrow needles present minimal surface area to drying winds. Because chlorophyll is present year-round in the dark green, heat-absorbing needles, photosynthesis can begin with the arrival of the sun. The tall, slender habitus of evergreens tends to prevent branch-breaking buildups of snow on the tree boughs. Trees of the boreal forest may occur in extensive stands of a single dominant conifer species, as mixed stands of a dominant conifer with a codominant conifer, and as mixed stands of coniferous and hardwood trees. Further, understory plant communities vary widely, depending on soil type, permafrost, altitude, latitude, duration of direct insolation, and rainfall/snowfall amounts. These same factors also shape the makeup of the dominant conifer communities. The interior forests of Alaska and the taigas of Canada and Siberia are generally characterized by very cold winters and modest annual precipitation totals. 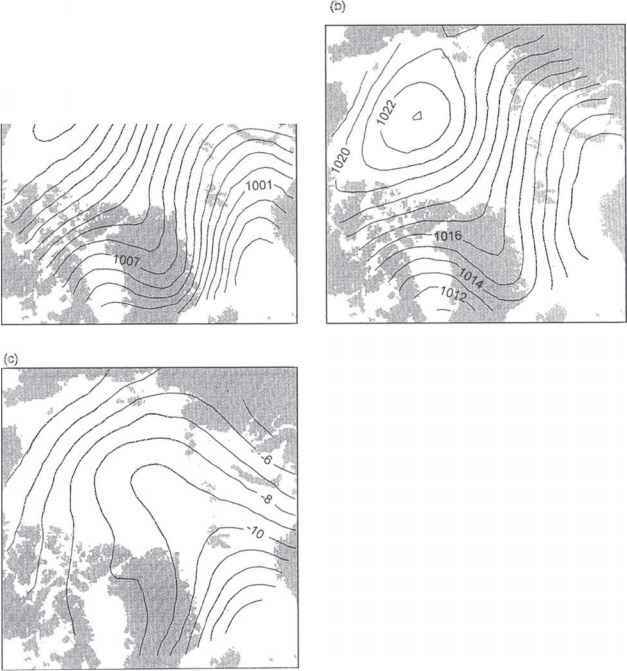 Because of the influence of relatively warm ocean currents (and, in the case of northern Europe, warm winds from the tropics), winters are much more moderate and annual precipitation is more abundant in the Pacific Forest of northwestern North America (200 in(5080 mm) not uncommon) and in the boreal forests of northern Scotland, Norway, Sweden, Finland, and the Kola Peninsula of the Russian Federation (22% of the world's forests are in the Russian Federation; in contrast, Canada has 7% and the United States has 6%; Brazil has 16%). Collectively, the world's boreal forests constitute a vast carbon storehouse; the forests of the Russian Federation hold 20% of the world's carbon. In North America there are three major manifestations of the coniferous forest. Stretching about 3000 miles (4828 km) from the Santa Cruz Mountains in California to Kodiak Island in Alaska is the Pacific Forest or the Temperate Rain Forest. Moist air off the Pacific Ocean, cooling as it rises over the coastal mountains, produces copious amounts of winter rainfall (snowfall if the temperature is right) and summer fog over the western slopes and creates conditions that support the huge conifers characteristic of this region such as coast redwood (Sequoia sempervirens in California and Oregon), Douglas fir (Pseudotsuga menziesii (= P. taxifolia), especially in Washington and Oregon), grand fir (Abies grandis), white fir (Abies concolor), Pacific silver fir (Abies amabilis), Sitka spruce (Picea sitchensis), western red cedar (Thuja plicata), Alaska cedar (Chamaecyparis nootkatensis), subalpine fir (Abies lasiocarpa), and western hemlock (Tsuga heterophyl-la). The second major forest region, the Rocky Mountain Forest, is obviously associated with the flanks of this mountain range. While dense stands of conifers are not uncommon, the more general condition is that the trees are rather widely spaced and that the stands are separated from each other by large and small expanses of subalpine meadows. Some common tree species of this region are the limber pine (Pinus flexilis), white-bark pine (Pinus albicaulis), western larch (Larix occidentalism, Englemann spruce (Picea engelmannii), Douglas fir, western white pine (Pinus monticola), ponderosa pine (Pinus ponderosa) ,and lodgepole pine (Pinus contorta), a species that often becomes established after fires. By far, the largest forest region in North America is the Northern Forest. From a narrow strip along the higher elevations in the Appalachian Mountains, where red spruce (Picea rubens) and Frazer fir (Abies fraseri) are common, this forest expands across the breadth of Canada and extends into Alaska. The most common tree species are white (Picea glauca) and black (Picea mariana) spruce, but many other species of conifers, such as eastern white pine (Pinus strobus), northern white cedar, eastern hemlock (Thuja canadensis) and balsam fir, and deciduous trees, especially aspens, alders, birches, and poplars, are well represented. Forest fires are the supreme natural arbiters of survival and succession in the Northern Forest and in the comparable taiga zones of Eurasia. Each of these three major forest regions of North America can be characterized in a very general way by its plant and animal communities, all finding expression within certain parameters of climate, altitude, latitude, slope, soils, and other aspects of the geographic setting. But, like their counterparts in Eurasia, each major region has been further divided into numerous ecoregions or ecozones, each one of which, in turn, has its own set of biological and physical characteristics. 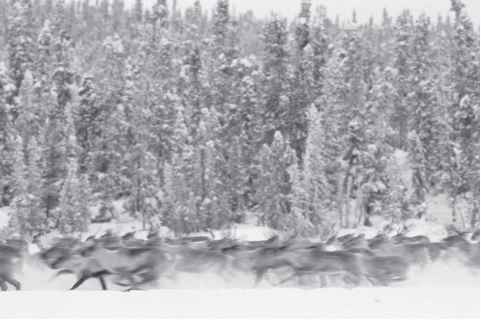 For example, Canada is composed of 15 defined ecozones and the Yukon Territory has 23 defined ecoregions. Alaska has 13 ecoregions and at least 30 different forest types within the general category of boreal forest. Large and small accumulations of water are very common all across the taiga (see Freshwater Ecosystems). The smaller, shallower ponds tend to fill in with sphagnum mosses and other plants forming bogs (called muskegs in North America), where decomposition of plant materials proceeds very slowly. Trees surrounding the bogs, especially black spruce and larch (Larix laricina in Alaska and Canada; various species in Eurasia such as L. siberica in east central Russia and the Dahurian larch, L. gmelinii (=L. dahurica), the dominant conifer in the permafrost regions of Siberia east of the Yenisey River), tend to encroach upon the bogs and eventually transform them into forest. Because tamaracks (L. laricina) are intolerant of shade, other invading conifers usually eventually replace them. While tamaracks may be found on upland sites, they are more typical of boggy sites (muskegs), acid peatlands (pH usually 6.0-6.9 but can be as low as 4.3), and lake and stream borders. Typical larch root systems, being very shallow and wide spreading (often exceeding in diameter the height of the tree), are well suited for moist soils underlaid by permafrost. While forest fires easily kill larches, these trees are often early invaders of burned peatlands and open bogs. But because their seed dispersal distance is very limited, larches do not quickly spread over large burns. Because larch trees cast a light (diffuse) shadow, larch forests of the Nearctic Region typically have a thriving understory of shrubs, herbaceous plants and fungi and other primitive plants such as, among many others that could be named, red-osier dogwood (Cornus stolonifera), bog birch (Betula glandulosa), various berry-bearing shrubs (Vaccinium spp. ), swamp birch (Betula pumila), leatherleaf (Chamaedaphne calyculata), hoary alder (Alnus incana), various willows (Salix spp. ), bog-rosemary (Andromeda glauco-phylla), Labrador tea (Ledum groenlandicum), bush cinquefoil (Potentilla fructicosa), bunchberry (Cornus canadensis), various grasses (cottongrass, Eriophorum vaginatum) and sedges (Carex spp. ), running ground pine (Lycopodium clavatum), reindeer lichens (Cladina mitis, C. rangiferina, C. stellaris) and sphagnum (Sphagnum spp. ), and other mosses. Again because of their shade intolerance, tamaracks often grow in even-aged stands. In mixed stands, especially on peatlands, their most common associate is black spruce. In Alaska, quaking aspen (Populus tremuloides) rarely stands with tamarack, but it is a common associate in the Lake States, New England and Canada. Other com mon associates in the Lake States are red maple (Acer rubrum), white spruce (Picea glauca), black ash (Fraxinus nigra), red pine (Pinus resinosa), white pine (Pinus strobes), balsam fir (Abies balsamea), and arbor-vitae (northern white cedar, Thuja occidentalis). Common Canadian associates include paper birch (Betula papyrifera) as well as white spruce, quaking aspen and balsam fir. Balsam fir is the dominant tree species in the eastern region of the Canadian boreal forest biome. Red pine (Pinus resinosa), often codom-inant with the jack pine (Pinus banksiana), occurs in extensive stands around the Great Lakes and eastward into New England and southeastern Canada.